These groups meet on alternate Mondays of each month from 6:00 pm to 9:00 pm. Come join the fun and learn from experienced stone carvers and faceters. From soapstone to hard gem carving, your imagination is the only limit. Typical project sizes are smaller scale. Members are asked to be responsible for their own clean up. Every Tuesday bring along your projects, or take part in a group project, and enjoy good company while you work. This is a popular night, and there is always something to learn. Various courses are held at the workshop. Please contact the workshop for more information. There are a wide variety of jewellery courses available in the Ottawa area. Why not take a course and learn a new and interesting skill? Who knows what beautiful things you might create? Courses are offered at the workshop, at the Nepean Sportsplex, and by individuals around the city. Drop by the club, where members are sure to share some tips. 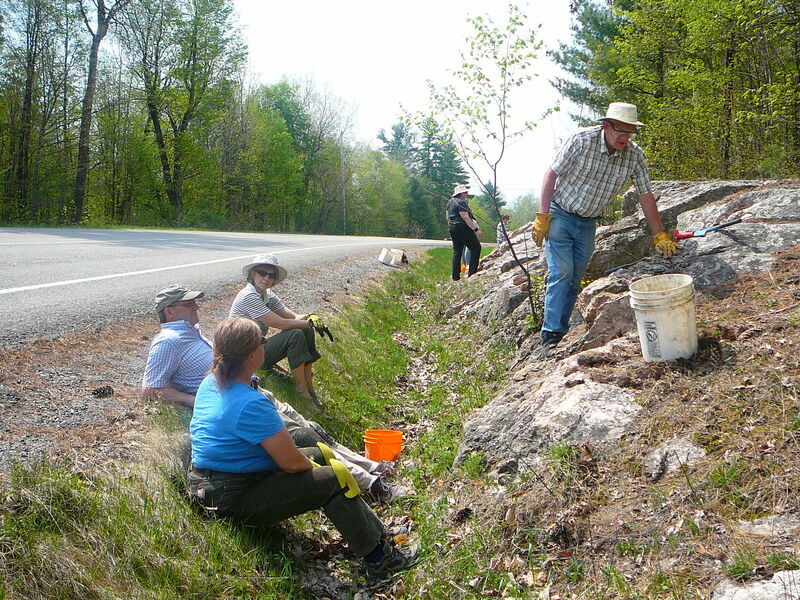 In the Ottawa area there are many rock collecting sites of interest, and these provide great destinations for our field trips. Interested members also organize and participate on longer trips to regions such as the North Shore of Lake Superior and the Maritimes.Current Planned Field Trips for 2014. The OLMC encourages members to make suggestions, and the club will help to find other interested people and oragnize them. Field trips are open to members only. Members must remember to renew their memberships prior. Safety equipment may be required in some areas. Safety equipment includes steel-cap boots, security vest, safety goggles, hard hat and gloves. 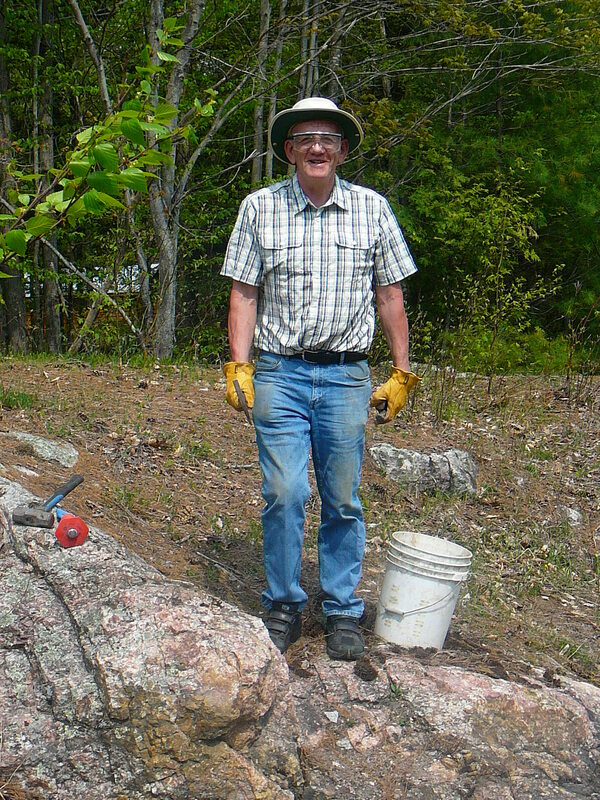 Mineral Collecting Law in Ontario: Visit the Ministry of Northern Development and Mines site to find out your rights and responsibilities as a hobbyist rockhounder. 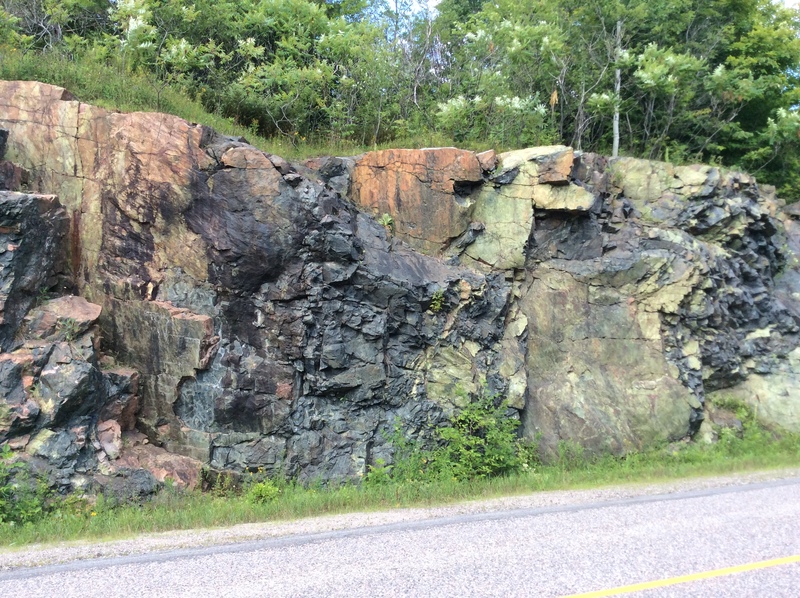 Bancroft July 24, 2016 The Mineral Interest Group will attend the Bancroft Gem and Minerals Club�s show which occurs one week before the Rockhound Gemboree, the big show. This is a really worthwhile trip, very relaxing and social. Arrival in Bancroft will be at 10:30am, and we will take in the show, have lunch, return to the show or do something else, and then return with dinner in Perth. Cabonga Aug.16-18, 2016 Three cabins at Le Domaine have been booked for Tuesday to Thursday, August 16-18 between 4 pm Tuesday and Noon Thursday. The cabins can accommodate a total of 18 people. First come first serve. As of August 20 there are 12 spots left. The cabin price is $430/6 people/two nights ($71.66/person). One main room with heat and furniture. In suite bathroom with tub and shower. There is a $25/person deposit payable to Kerry Day. The balance of $46.66 is payable by July 17. Guests are encouraged to bring their own drinking water or boil the local water before consuming. A small campground suitable for one tent is currently available at nearby Lac Rapide for $60/two nights. Water is available. Electricity and sewage hookup are not available. If you wish to camp or park your RV with our tour guides on the shore of the reservoir it is free but the only service available is a portable outhouse. Perthite May 26, 2018 Frank Stoyles is organizing a trip to a perthite site near the Rideau Ferry. Any OLMC member is welcome. The site is just past Glenn Drive on Elm Grove Road in Perth. The location has limited space, so people must take turns getting material. There is a great amount of top quality material to be found and it is right at the side of the road. If each person takes only a half kilogram or so of material, everyone should get enough to cut some nice stones. If the Silver Queen Mine tour is operating that day, this turn-of-the-century mica mine would provide an educational side trip. The mine is a few kilometres from the perthite site. 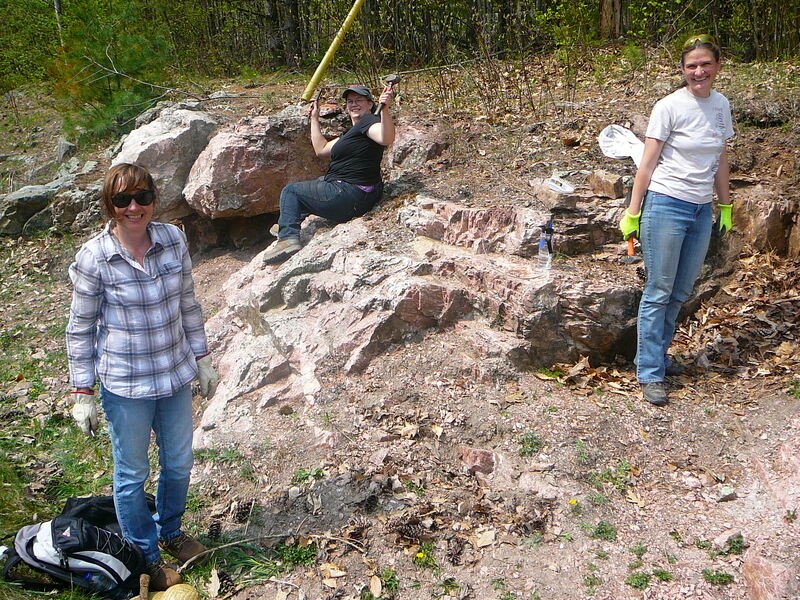 Bring gloves, a hat, sturdy shoes or boots, and it is recommended to bring a chisel, a hammer, and some lunch. Fishscale Peristerite June 9, 2018 A household in Perth is willing to allow some rockhounding on his property in exchange for a $10 fee per person and maximum 5 pounds of material per person, plus the usual good etiquette. This is a great privilege, as the site was closed for a long time due to some bad apples in the rockhounding community. I will meet those attending at All Saints Lutheran Church at the intersection of Pinecrest Road and the Queensway at 9a.m. We will check at the Tim Horton�s in Perth on Highway 7 for those who prefer to meet there. We should be there by about 10 a.m. This Timmy�s is about 1/2 km west of the MacDonald�s. The equipment required is minimal. Don�t buy much if you don�t already have it � we can share. If you have them, bring a rock hammer, a small sledge, chisels, a collection container (cloth bag or bucket) and a small garden rake. Also bug repellent, gloves and sun protection is wise. Lunch is optional of course. If you prefer, there are some good restaurants in Perth. Beryl Pit at Quadeville Oct. 13, 2018 This is a popular place to visit. Frank Stoyles is leading a trip to Quadeville Beryl Pit on May 30. E-mail him if you want to attend. Meet at All Saints Lutheran Church at the intersection of Pinecrest and the Queensway at 8:00 a.m. Drive 2.5 hours to Quadeville. There is a $10 fee to enter the pit, payable at the corner store. You will find: beryl, peristerite, amazonite, smokey quartz, black tourmaline, weak perthite, weak rose quartz. Bring lunch, bug repellant, gloves, hammer chisels, goggles, buckets/bags, spray bottle. Bennet Lake By invitation OLMC members requested an invitation to visit a disused feldspar open-pit mine at Bennet Lake, north-west of Perth. Feldspar has a number of industrial applications, including the use as a flux agent in ceramics. 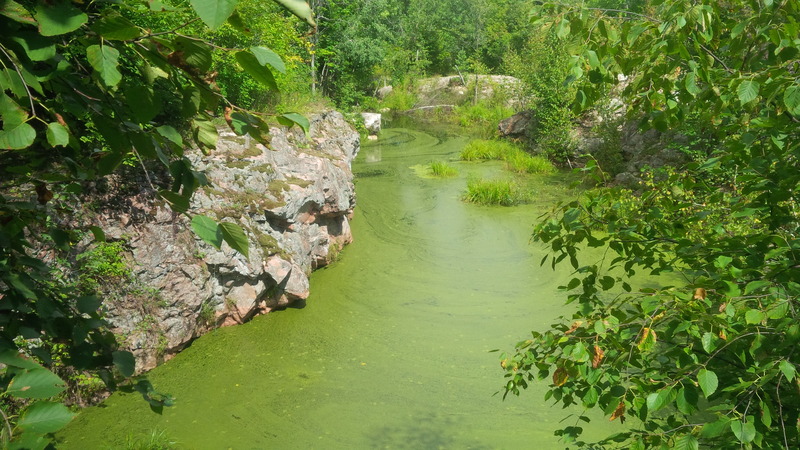 There used to be a number of small mines in the area, and the most famous was probably the Silver Queen Mine around Murphys Point Provincial Park, where mica, phosphate and feldspar were mined. 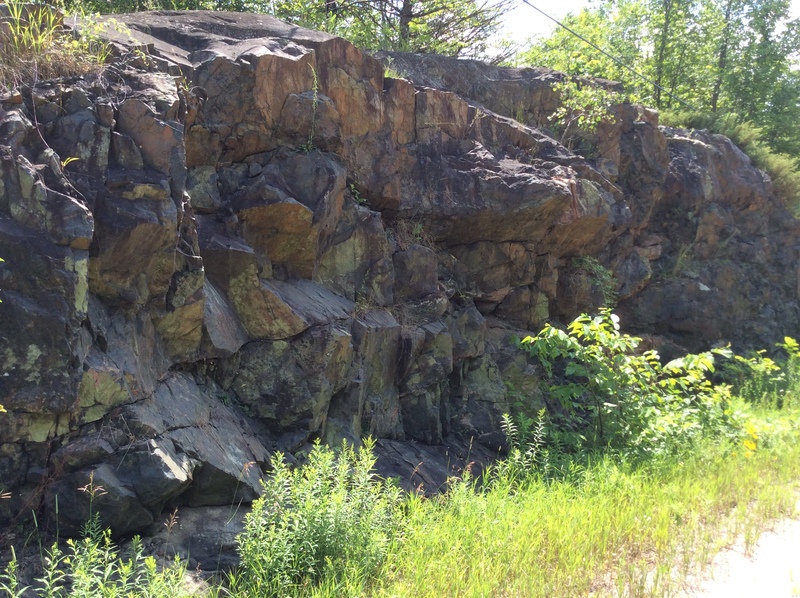 Between 1926 and 1953, the Bathurst Feldspar Mine was the second-largest producer of feldspar in Ontario. 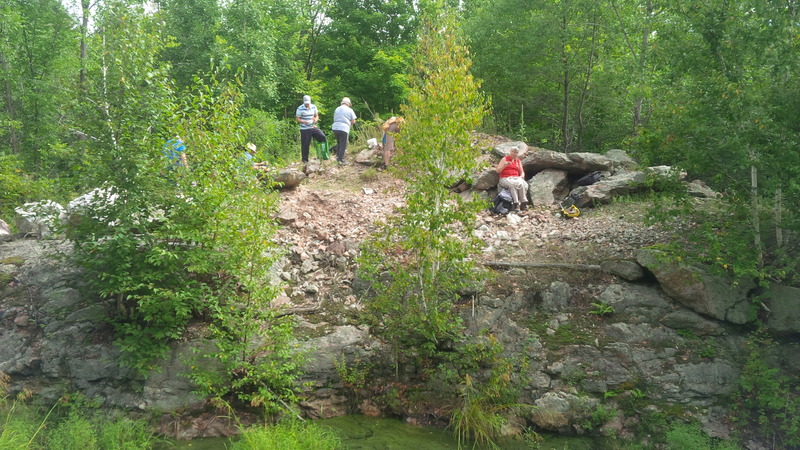 St. Mary's Quarry Oct. 21, 2018, CCFMS-sponsored This location is NOT open to collecting by individuals or groups other than these scheduled trips. The trips are open to all members of CCFMS. No fee is charged, however, a CCFMS affiliated club membership card needs to be produced prior to entry. Pre-registration with the trip leader is required so we have a good idea of the number of participants. Conditions: This is a working quarry. Collectors must be 16 years of age by law. No exceptions. You will require full safety equipment which includes safety helmet, safety goggles, CSA Approved "green patch" steel-toed safety work boots and a reflective safety vest. A sign-in, sign-out policy is in effect. Liability Waiver: You must be a current club member of a CCFMS club. You will be asked to show your rock club membership card as proof. You will be required to sign in with the Trip Leader and sign a liability waiver. You are expected to follow all instructions regarding safety, collecting & courtesy as outlined during the safety talk before entry to the quarry. Directions: Exit 401 at Waverley Road (Exit #431). Go south on Waverley, turn right just before the St Mary Cement Co. sign (as in the above picture) and after about a couple hundred yards will be first entrance with building on the left.. 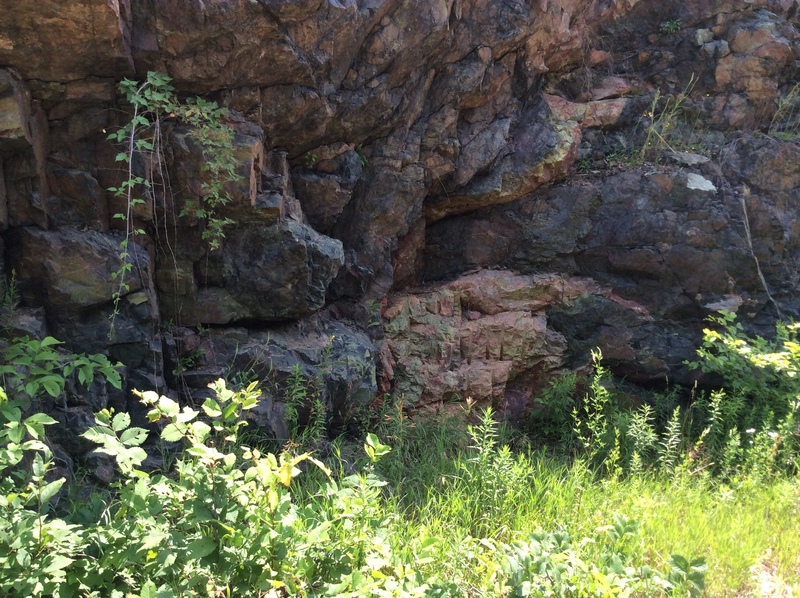 This is the office and entrance to the quarry. Turn left into the parking lot. 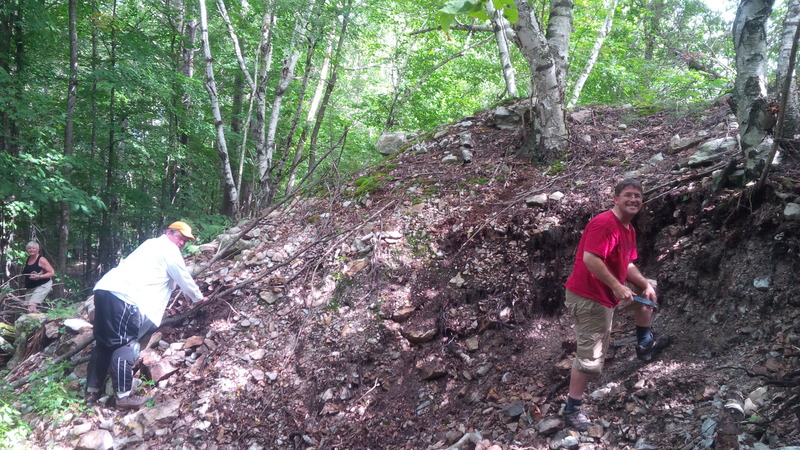 Smart apatite mine near Golden Lake Sept. 17, 2016 There is a $10 charge to enter the property. Materials to be found are: apatite, titanite, feldspar and hornblende. As an addition to the digs, members may want to take in the very good museum in Eganville, which has a good collection of local minerals and fossils. 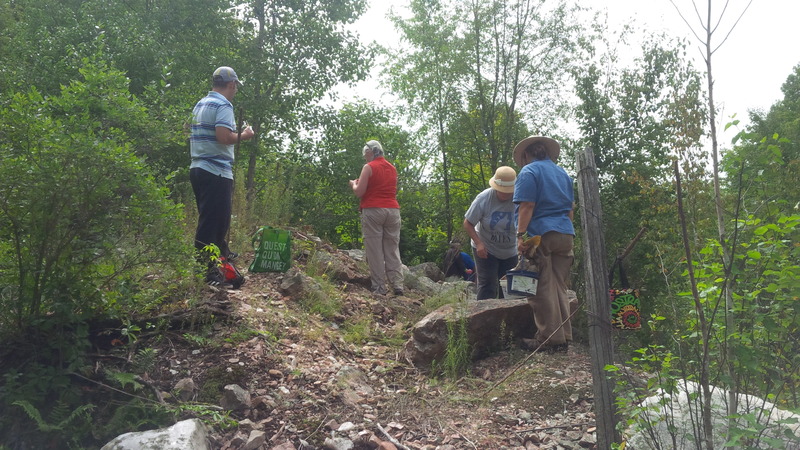 There is also a geological walk in Eganville with posters explaining the local geology. Finally, the Bonnechere caves are also nearby. Equipment: hammer, chisel(s), bucket or carrying bag and the usual bug repellent, water, lunch etc. Participants must assume responsibility for their own safety. There are open trenches on the property. Highway 5 TBD Breakfast and trip briefing at La Vallee Restaurant-Motel, 1418 Route 105, Chelsea, Quebec, J9B 1P4. Then leave for the site starting South, proceeding North. When the construction security team passes through, if they find anyone acting in a reckless manner you may be asked to leave. Please be mindful of safety no matter how nice the rock may look! What to wear: CSA Certified Hard Hats (yellow construction hat), CSA Certified (Green Triangle) Steel toed boots, Eye protection (only when swinging hammer though), Orange Safety Vest (overcoat vest used by all road construction crew), Long pants, sleeved shirts, and working gloves. What else to bring: Chisel, prying bar, and masses (as you wish; many samples can be picked from the ground); Newspaper and pails or cloth bags to wrap and carry your specimens; Water and food. There are groceries and restaurants that are not far around, but it may be best to bring at least a bottle of water and some snacks. 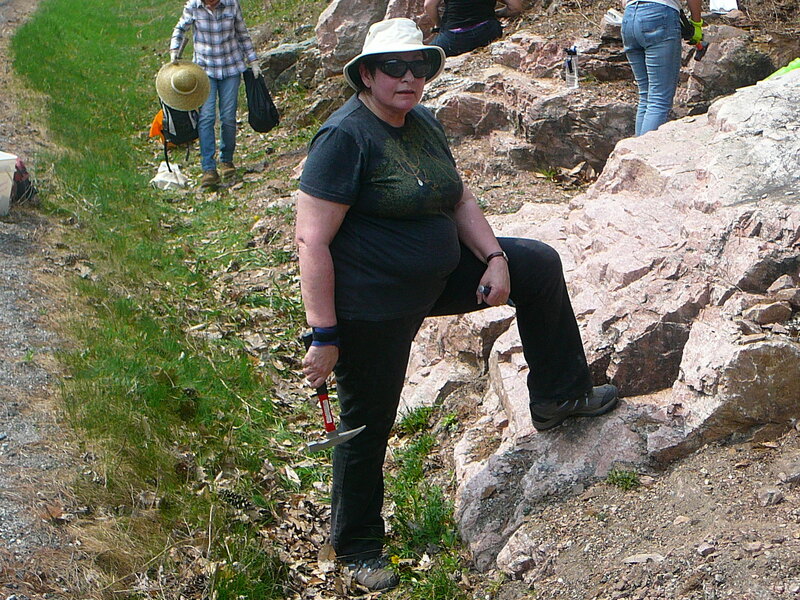 What you may find: Scapolite, Tremolite, Diopside, Galena, Pyrite, Unknown florescent minerals (over five species so far! ), Serpentine, Magnesite, Apatite, Biotite, Phlogopite, Calcite crystals, Quartz crystals, and much more, including a bunch of fellow rock hounds enthusiast! 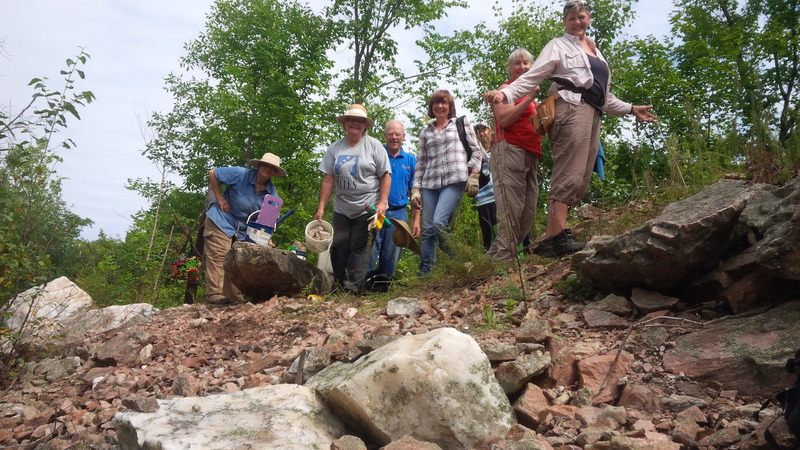 Kaladar Oct. 27, 2018 A fieldtrip to a Tourmalinated Quartz locality north of Kaladar, led by Kerry Day. It is about a 2.5 hour drive down Highway 7, then north on Highway 41, and then down logging roads. Please meet at the workshop at 8 AM or the Shell station in Kaladar at 9:30 AM. Minerals to collect include Tourmalinated Quartz (black Schorl Tourmaline) and Amphibolinated Quartz (brown Actinolite). Membership is open to all interested persons upon the payment. Annual membership fees are: $20.00 / individual, and $ 30.00 / family. This does not cover individual field trip expenses or workshop fees. Newsletter advertising costs $25 per year for members. Businesses wishing to advertise in the newsletter pay $55, which is the advertising fee plus a family membership. The membership year runs from the 1st of January to the 31st of December, but people who sign up at the annual gem show get an extra three months (Oct-Dec). Membership fees are due at the end of the year. New members are welcome any time. Simply fill in, print out, and then mail in the membership application form.